Alba Jacob Leighton, son of Silas Washington Leighton and Harriet Emaline Nichols, was born Aug. 12, 1871 in Groveland, Tazewell Co., Illinois and died Nov. 3, 1951 in Gravity, Taylor Co., Iowa. He married Estella Blanche Osborn Dec. 29, 1896 at Clarinda, Page Co., Iowa. 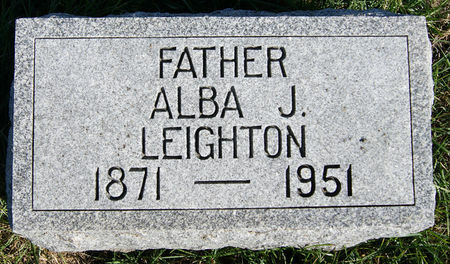 Searching for ALBA JACOB "AL" LEIGHTON in Taylor County Iowa?